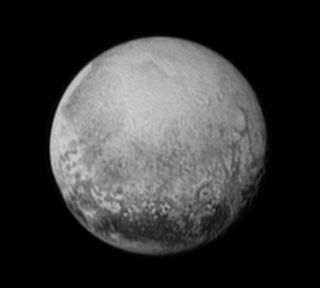 Image of Pluto captured by NASA's New Horizons spacecraft on July 11, 2015. The photo shows linear features that may be cliffs, as well as a large circular feature that could be an impact crater. On Tuesday morning (July 14) — nine and a half years after launching, and a quarter-century after its mission began to take shape — NASA's New Horizons spacecraft will perform history's first flyby of Pluto. Closest approach will occur at 7:49 a.m. EDT (1149 GMT) Tuesday, when New Horizons zooms within just 7,800 miles (12,500 kilometers) of the dwarf planet's frigid surface. "The spacecraft is performing very well. The data that we're getting to the ground is beautiful," Stern added. "The energy in the room with the science team, the energy in the room with mission control — it's just electric." On Sunday, NASA and New Horizons scientists unveiled the latest photos from New Horizons, including a tantalizing view of what appear to be canyons and craters on Pluto's big moon Charon, and a new view of the dwarf planet itself. You can see a video of New Horizons' latest Pluto views here. New Horizons is "a capstone mission," New Horizons project manager Glen Fountain, of the Johns Hopkins University Applied Physics Lab in Laurel, Maryland, told Space.com. "It is the completion of this initial reconnaissance of our solar system." If all goes according to plan during the flyby Tuesday, New Horizons will map the surfaces of Pluto and Charon in detail, study the two objects' geology, characterize Pluto's wispy atmosphere and perform a number of other investigations. The close-approach images will be spectacular; New Horizons should be able to discern features on Pluto as small as the ponds in New York City's Central Park, mission team members have said. Images captured by New Horizons over the past few weeks have already begun bringing Pluto and Charon into focus, and heightened anticipation for the supersharp photos to come. For example, the probe's observations have revealed that Pluto's surface is complex and varied, with many different bright patches (including a huge, heart-shaped one) and dark features (including a giant one mission scientists have dubbed "the whale," as well as a series of curious dark blotches lined up along the dwarf planet's equator). "When we get a clear look at the surface of Pluto for the very first time, I promise, it will knock your socks off," Stern said in a statement earlier this month.